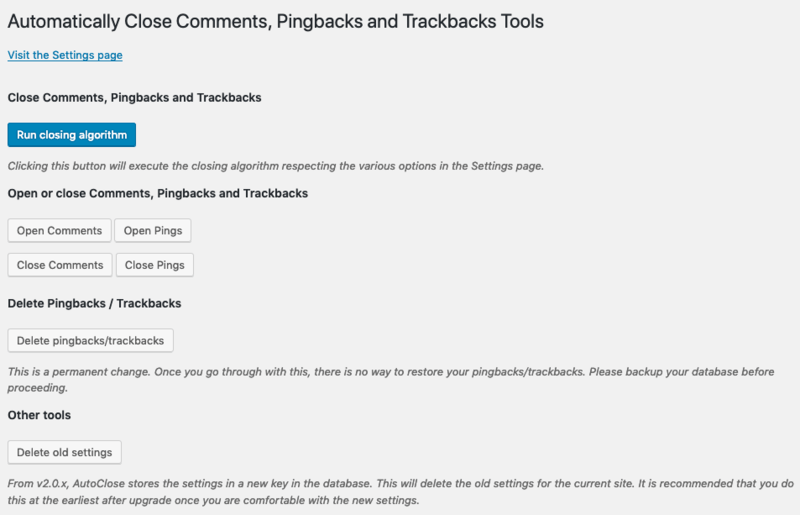 I’ve released a major update to Auto-Close Comments, Pingbacks and Trackbacks a.k.a AutoClose v2.0.0. The last update to this plugin was in 2015 and this has continued to work with the newer versions of WordPress. Autoclose is an easy to use WordPress plugin that allows you to automatically close comments, pingbacks and trackbacks on your posts. You also have some buttons that let you delete post revisions, delete pingbacks and trackbacks. I was cleaning up broken links on Techtites and realised most of these were pingbacks and trackbacks. I wanted an easy way to just delete them all! Hence, AutoClose v2.0.0. The plugin file has been renamed from ald-autoclose.php to autoclose.php which will cause WordPress to deactivate the plugin when upgraded. You will need to activate this again from the Plugins page. The reactivation should also upgrade the plugin settings to v2.0.0. You can also Network Activate the plugin on WordPress Multisite and it should upgrade settings across all the sites. I’ve rewritten AutoClose v2.0.0 with cleaner code to better WordPress standards. The plugin also uses the Settings API in WordPress to register and update the settings. You will now find a clean tabbed interface that allows you to configure the general options, activate the WordPress cron for scheduled closing. Further configuration is available under the other tabs. You’ll also find a link to a new Tools page that has a whole series of buttons. You’ll find buttons to open and close Comments and Pings (both pingbacks and trackbacks). There is also a new button to delete pings. This is ideal for those who no longer want those outdated pingbacks and trackbacks on their site. There is also a button to delete the settings from v1.x. Please use this only after you’re fully happy with the upgraded settings. I will keep maintaining a list of features to implement can be found in the Issues page on Github.